My staff and I keep up with all the developments in roofing materials so you don’t have to. We work with GAF, the country’s largest roofing repair manufacturer to stay certified on all their newest materials or techniques. But sometimes it’s fun to take a look a few steps into the future to see what your next new roof (or a couple of roofs after that) might be like. There are some roofing tiles being developed at MIT that change color for best energy efficiency. When the heat pounding on your roof is at its most intense, each tile changes from black to white. This change of color reflects back much of the heat and keeps your home cooler. When there is less heat, like in the winter, the tile stays black and absorbs more heat, keeping the home warmer in the winter. Of course, the cost would be prohibitive now because these tiles are in the development stage, but this would be a nice feature to have in the future – an “intelligent” roof. Here’s another new development. In some cities, you can’t add conventional solar panels to your roof because of zoning restrictions. Maybe in time these restrictions will change but right now, some people who want to migrate to solar energy aren’t allowed to. There’s a company making roofing tiles shaped just like the usual terra cotta ones but each tile is coated with a photovoltaic film. In other words, the film on these tiles converts sunlight into electrical energy you can use. But it looks like those houses that have shiny blue tiles on their roofs. You can use these tiles on just part of your roof or the whole thing. Existing tiles can be stained to match. I love this idea. The next type of new roof is a throwback to an old technology. Ever see an old movie or photo of a thatched roof with ferns growing out of it? There are new roofs with plants growing across the entire surface. You may have seen some articles about this one – it gets some media coverage. This type of roof can range from a rooftop garden to one covered in moss, requiring much less soil depth. A moss roof would therefore be much lighter weight but would still be effective in providing thermal protection for the building, converting carbon dioxide into oxygen, and controlling and utilizing water flowing off the roof and into sewer systems. 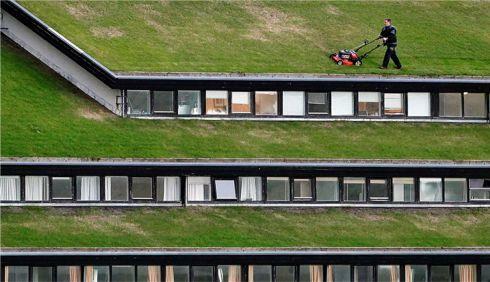 Imagine a city full of green roofs. It would sure give a different impression. Currently, there are 1.4 million square feet of US government buildings that are devoted to greenery. 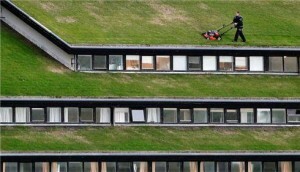 One report on green roofs is that a conventional gravel roof can range between 140 and 176 degrees Fahrenheit, but a grass-covered roof won’t rise above 77 degrees. Imagine the energy savings. Most of the residential properties I work on have pitched roofs and obviously these green roofs need flat space. So this is more of a commercial building solution. But these other roofing/energy solutions may become cost-effective before long. Maybe the next time you need a roof replacement, we’ll be talking about solar or color-changing tiles.